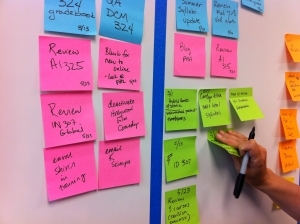 Kanban is a scheduling system for lean and just-in-time (JIT) production. It is an information system where the supply or production of a product is determined by the actual demand of the customers. Therefore, products are supplied or produced in the amount and time required. Kanban is a Japanese word that can be roughly translated as “signboard”,“billboard” or “card you can see”. This name was given to the system because, in its simplest implementation, it uses cards as the signal to replenish materials or products. This system was developed by Taiichi Ohno at the Toyota as a system to improve and maintain an efficient and high level of production. In the Kanban system, cards are placed in the containers of every material needed for the production of a product or the provision of a service, they can even be placed in the containers of a finished product. When the material or product has been consumed and the inventory numbers have reached a critical point, these cards signals the replenishment of that product or material. These cards have all the necessary information in order to effectively provide the product or material in the amount, place and time needed. Do not send defective products to the subsequent process. The subsequent process withdraws only what is needed. Produce only the exact quantity withdrawn by the subsequent process. Kanban is a means of fine tuning. Stabilize and rationalize the process. Wasted work and time is reduced. More time can be available to improve the processes. Delivery of products and materials is improved. This system enables organizations to operate on the principle of “pull production” instead of “push production”; in a pull-based supply chain, procurement, production and distribution are driven by customer’s demand rather than based on forecast demand of a product. Although historically Kanban system uses cards to signal the need for a product or material, in many organizations these have been replaced by plastic markers, balls and, more recently, by signals that are sent electronically using sophisticated software. Whichever method an organization wishes to choose, Kanban will enable them to align their inventory levels with actual consumption, thus improving their efficiency and allowing them to produce exactly what they need when they need it.